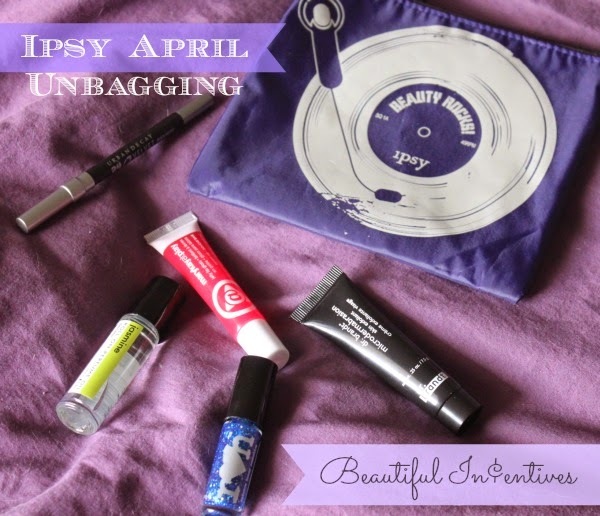 Beautiful Incentives: April #Ipsy Un-bagging 2014! Ok, I'll admit at first I wasn't too thrilled with my Ipsy glam room preview. I'm going to be blunt because it's needed. I'm entirely sick of getting lip glosses. I'd rather get mascara than lipgloss every month. I have no need for it. The one by Mary Kay in this month's bag is just as underwhelming as the others, but I'm not a big fan of lip glosses. 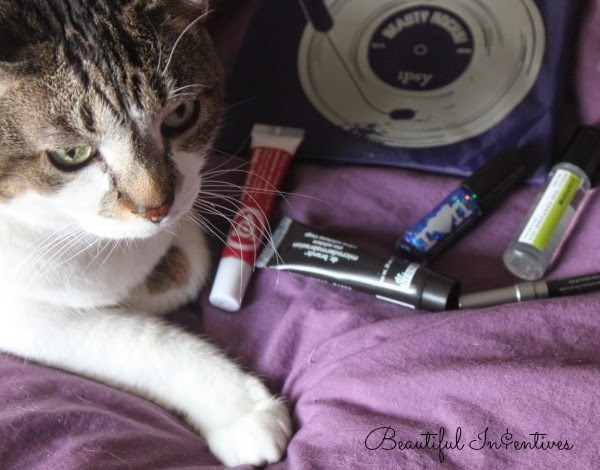 I adore lip balms and lipsticks, but I don't have the luxury of choosing which kind of lip product I get. though I can't complain because I do love a good mystery. Regardless, the rest of the products make up for that one letdown! Of course, so did the bag. It was pretty awesome this month, so I am pleased. Ipsy always redeems themselves in some way and it's well worth the subscription for $10, BUT if that number ever climbed, I could not justify the cost. If you want generous travel and full size samples of up and coming or tried and true products, you need to subscribe to Ipsy! 1. Rainbow Honey Nailpolish-The blue sparkle confetti nail polish is really cute and I love wearing it as a top coat over a dark color. 2. Dr. Brandt Microdermabrasion scrub- I'm really not disappointed when I get facial scrubs. I love trying them out and this is one i have been wanting to try. 3. Mary K at Play jelly lip gloss - Not a fan of lip glosses. Especially the consistency of this one. 4. Demeter Jasmine scented perfume roll on- I'm not a big fan of floral scents, but this one has a sweetness to it I really adore. It's a nice size too. 5. Urban Decay 24/7 Glide-on black pencil- Um, Urban Decay and black liner, nuff said. It is a really nice eye liner and not too small for travel size. It went on very smooth and stayed put. I will get lots of use out of this beauty! The bag- Can we just take a moment to appreciate the awesome design of this bag. I love the artists over at Ipsy. This is one of my favorite bags! Stay tuned for May's un-bagging! If you haven't signed up with Ipsy yet, you're down right crazy not to. It's only $10 and that includes s/h! Every bag I have received has at least 2-3 things at the least I absolutely adore and it is absolutely worth the money! If you get on the Ipsy waiting list through me I will get a special something if I get one other person to sign up as well. You'll get the same when you sign 2 people up! Good Luck!